In my recent work I have been very interested in mapping and journeys, looking at the physical geography of a place, the journeys we take and the experience we gain. We tend to look at the countryside as a natural environment, whereas nearly every square inch of its surface has been transformed in some manner by centuries of mans interaction, from the patchwork of the fields to the network of trail and roads. What interests me as an artist are these layers of patterns and marks we have left on the landscape, what they tell us about the geology and topography and our relationship with it. Of late I have been working with shaping stone which I draw patterns on. The pattern for these lines are taken from detailed studies of aerial view maps illustrating the network of fields, lanes, roads and rivers. The stone is then sandblasted leaving a raised polished line and a contrasting textured finish. 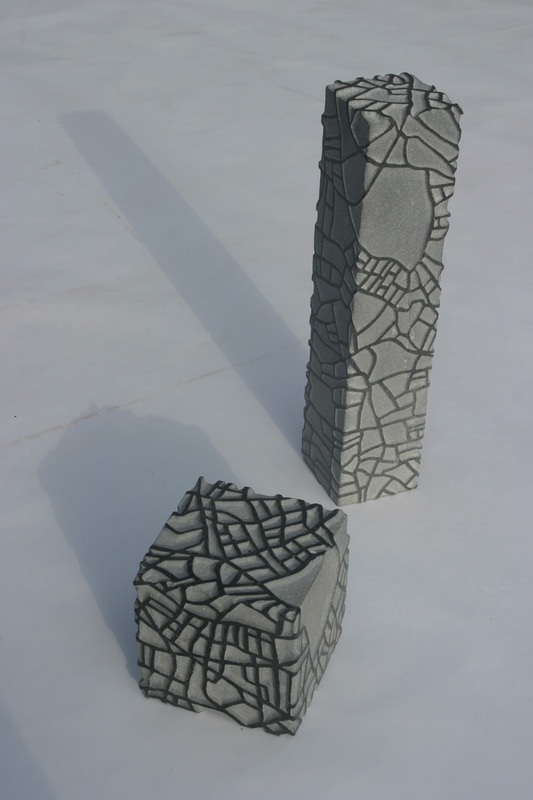 Often I inlay the stone with stainless steel representing a chosen location. The inspiration for these sculptures comes from observing the physical geography of a place and its continual metamorphosis. Since Graduating from GMIT, Galway in 1992 Michelle has exhibited in group shows in Ireland, Uk and France. In 1997 Michelle was invited by The Arts Council to have a solo show at their premises in Merrion Sq, Dublin. In addition to the exhibitions Michelle has worked on both private and public commissions.